Oil prices were a bit less tumultuous than in recent weeks – although there was plenty of up/down activity, they ended the week close to their starting point. The biggest development of the week came from Venezuela, where the National Assembly has declared the acting president Maduro illegitimate and pronounced an interim president. The military has sides with Maduro, however, so it’s unlikely this latest development will significantly alter the Venezuelan political situation. Weak economic reports from China also weakened the market early this week. China’s GDP in 2018 grew by the lowest level in almost 30 years, just 6.6%, which shows the negative impact on tariffs as well as domestic weakness. Because China’s economy has become so tightly linked with the developing world’s economy, this slowdown could have significant repercussions for growth in 2019, ultimately affecting oil demand. Crude oil prices were up and down this week, but overall have failed to deliver any significant movements. Crude began the week at $53.73 on Tuesday following the Martin Luther King Jr. Day holiday. 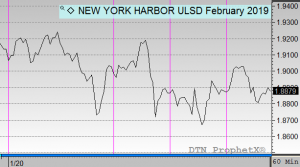 Prices dipped below $52/bbl as the week progressed, but regained strength later in the week. This morning crude oil opened at $53.17, a small loss of 56 cents (1.0%). Diesel prices saw slightly more significant losses as the week progressed, mainly due to a strong Tuesday opening. Prices opened at $1.9115, and the losses came steadily thereafter. On Friday, prices opened at $1.8870, a loss of 2.5 cents (1.3%). 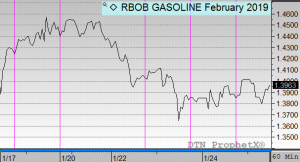 Gasoline prices has the steepest decline for the week, coming on the heels of strong gains the week prior. Monday saw gasoline prices open at $1.4435, the highest opening price since mid-December. That quickly turned lower though, and prices dipped below $1.40 the next day. This morning gasoline opened at $1.3891, a loss of 5.4 cents (3.8%).